Last Saturday, Justin and I attended his classmate Diego’s 7th birthday party at Shakey’s Katipunan. When it was time to sing Happy Birthday to the celebrator, a huge pizza, instead of a birthday cake, was brought out, complete with birthday candles. It was my first time to see a pizza that big! 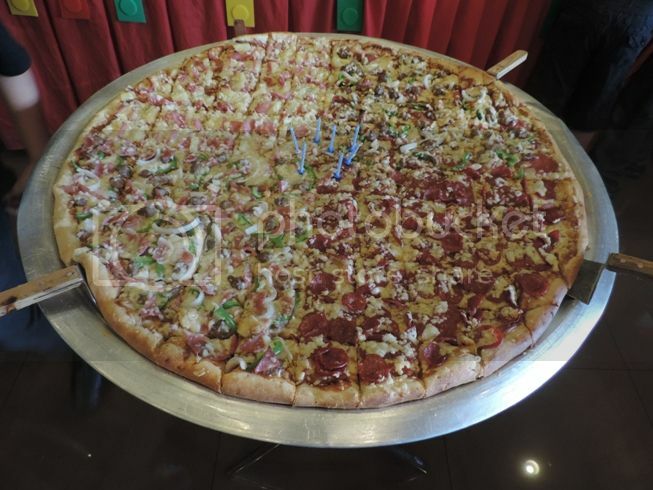 Because I was amazed, I simply had to take a picture of that ginormous Shakey’s pizza and Googled it afterwards to find out more about it. I learned that this Shakey’s Giant Pizza is 32 inches round (with approximately 121 square cuts) that can feed 30 to 40 people. It combines four different pizza flavors, namely: Manager’s Choice, Shakey’s Special, Hawaiian Delight and Pepperoni. It costs Php3,950, and you should order it 2 to 3 days in advance. The price differs, however, when you want to include the Shakey’s Giant Pizza in a kiddie party package. This entry was posted in Shakey's, Shakey's Giant Pizza. Bookmark the permalink. One Response to Shakey’s Giant Pizza!